Originating in Spain, the 13 coins wedding tradition symbolizes Christ and his 12 apostles. 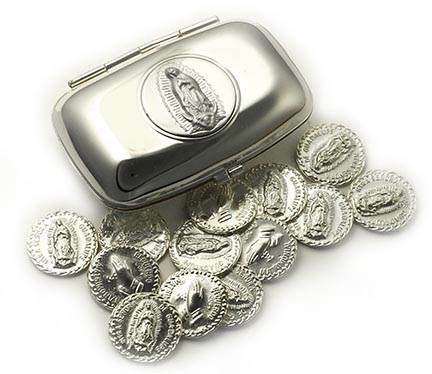 This wedding tradition is usually associated with Hispanic families and involves the groom giving the coins (either gold or silver) to his bride.The coins, or arrhea, was a Roman custom of breaking gold or silver, one half to be kept by the woman and the other half by the man, as a pledge of marriage. This signified his willingness to support her. The tradition usually places the coins in an ornate box or tray, and this holds good wishes for prosperity. These coins become a part of their family heirloom. The way the coins are traditionally used during the day of the wedding are as followed: coins are placed on a tray and handed to an assistant to be held until their specific moment in the ceremony. Near the end of the ceremony, the box and coins are given to the minister or officiant who places the coins in the box and hands them to the groom. The bride then extends her cupped hands to her soon to be husband, who will then pour the coins into her extended hands as a symbol of his unquestionable trust, confidence, and pledge to provide financially for them. Thirteen gold coins, will now be counted out to the groom.